Yakuyoke Jizoson Festival (厄除地蔵尊大祭) is one of the most popular Matsuri in Kofu, Yamanashi Prefecture. This festival happens at Entakuji temple that established in 808. So, this festival has been held for over 1200 years. The Principal Image of Entakuji temple will be shown only during this festival. 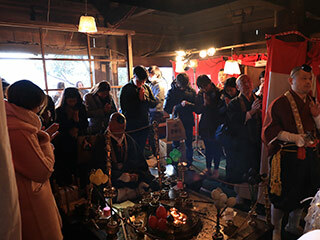 This matsuri held from Feb.13 noon to 14 noon only 24 hours. This Principal Image has a power to protect people and keeps the evil away from the people. It is unique stone-hearted wooden Buddha statue. Many people worship this temple and pray their safe. During the festival there are many food stands that you can enjoy Japanese foods. Many food stands will open. Date: Feb 13 Noon to Feb 14 to Noon, 24 hours. You can sign-up for the special ceremony. 1. use a local bus to Yumura Onsen Iriguchi. Entakuji Temple is Shingon Buddhism temple established in 808 by Priest Kukai. When Priest Kukai was traveling all over Japan, he made a buddha statue and enshrined at this place. That is the beginning of Entakuji. In 955, Priest Kuya donated his Buddha statue and built Entakuji temple. Every February 13 to 14, their principal image of the temple will be opened for public and there is a large festival held. The image has the power to protect the people from the disaster and listen to the wish of people. It is designated as the important cultural assets of Yamanashi. About 100,000 people join this festival every year. About 100 food stands and gift shops will open on the leading street.